Seaton Smith is one of the most exciting stand ups in New York City. Having honed his material in the comedy clubs and bars of The Big Apple, Seaton got his first big break in 2014, landing the extremely coveted role of ‘Motif’ on FOX’s ‘Mulaney’ alongside John Mulaney, Nasim Pedrad, Elliot Gould, and Martin Short. 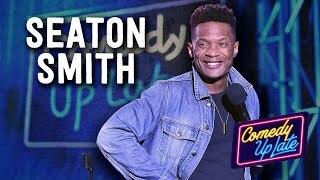 After a season on ‘Mulaney’ Seaton branched out and has appeared on hit shows including Comedy Central’s ‘Inside Amy Schumer,’ HBO’s ‘Girls,’ and Comedy Central’s ‘The Nightly Show.’ Seaton has also performed stand up on NBC’s ‘Late Night with Seth Meyers.’ In September 2015, Seaton released his debut album, Bologna Meat, which Laugh Button called: “…smart, energetic, and refreshingly clever … [Seaton] fiddles with unique views on the world…he continuously brings something new and exciting to stale topics.” Seaton is a regular headliner at some of the best comedy clubs and comedy festivals across the country.